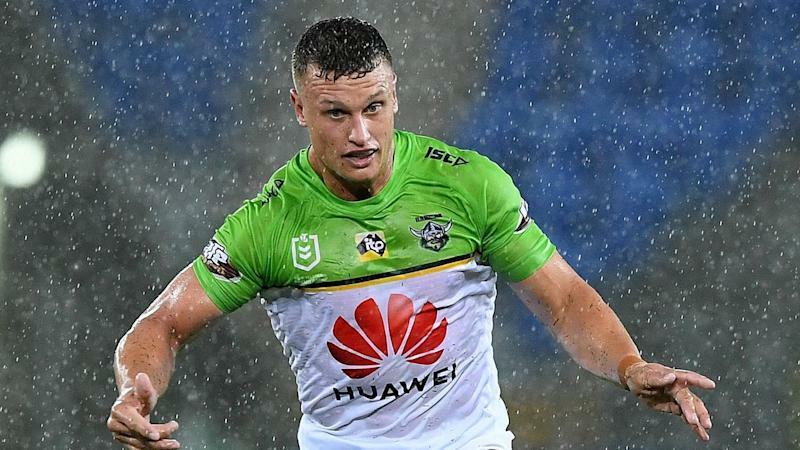 Canberra's Jack Wighton is just relieved to get his first NRL game in nine months out of the way. The 26-year-old missed the final 10 matches last season after being banned for assaulting five men in an alcohol-fuelled incident, which was captured on CCTV. Apart from a trial game against Canterbury in February, Wighton's last outing for the Green Machine was a win against Wests Tigers on June 17. Combine a comeback game with a switch to five-eighth and it proved to be a tense lead-in for Wighton to the Raiders' round one clash with Gold Coast. "I was a little bit nervous to get that one out of the road as it has been a little while, so it was good to get back out there," Wighton said. "I think we communicated well; Aidan (Sezer) ran the show and I passed the message, so I think we worked well. "I was happy with that start, I've done a lot of work over the pre-season so for us to come out and play like that was pleasing. "We've still got a lot to work on, it was a wet game, but we done well." The Raiders will face the might of Melbourne at GIO Stadium this Friday night. The Storm have dominated in matches against the Green Machine, but Wighton thinks Canberra can snap the hoodoo. "It's a new year so we'll try and change it," Wighton said.